While you may not like this guy, Kane is very much the straw that stirs the drink. Once again, the winger was the main man for Chicago with 89 points. Narrowly missing out on another Hart Trophy nomination, Kane was a constant thorn to blue liners. A real game changer and now officially one of the league’s elite, it was a surprise to him and his side struggle in the first playoff round. Wounded and hungry for revenge, expect big things from his guy next year. During an awful year for the Avalanche (sorry Carl), MacKinnon was the one bright spot. Fully justifying his first overall selection, MacKinnon has emerged as a player to build the side around. His meagre 53 points might not sound impressive, but when you consider the lack of offensive support; it reads very differently. Voted into the 2017 All-Star game, the Avs might want to keep a tight hold on the 21-year-old. The Stars were falling around the American Airlines Arena in 2017. Going from an attacking force to lower end mediocrity. The one consistency was the scoring of winger Tyler Seguin. Linking up well again with linemate Jamie Benn; Seguin has lost none of his potency in front of the net. His 72 points were about the only thing keeping Dallas sinking. He also broke into Hollywood with his blink and miss it cameo in ‘Goon: Last of the Enforcers’. Only 25-years-old he is fast becoming something special. Would Minnesota even have made the postseason without this guy? Since arriving in 2014, Dubnyk has been like a wall in net. Posting a 40-19-5 record during the regular season with a tiny 2.25 GAA, Dubnyk was cruelly left off the Vezina nominations. He can still take solace in his career season and after been given such a hard time in Edmonton, it is fantastic to see him rebound. Dubnyk is well loved by Wild fans, let’s hope next year sees him richly rewarded. “WHAT? NO P.K. ?” Before you let the blood boil in your veins, hear me out. P.K. might have been the spirit of the Predators, but Johansen has made the difference. Finishing as top scorer with 61 points, Johansen has been a revelation at the Bridgestone Arena. On the powerplay is where his real strength has shown and he clocked up an amazing 23 PP points. Sadly, his impressive playoff performance was cut short due to injury. If Nashville wins, this guy deserves the credit. Although St Louis will have to wait yet another year for a shot at the cup, Tarasenko was in fine form during 2016-17. 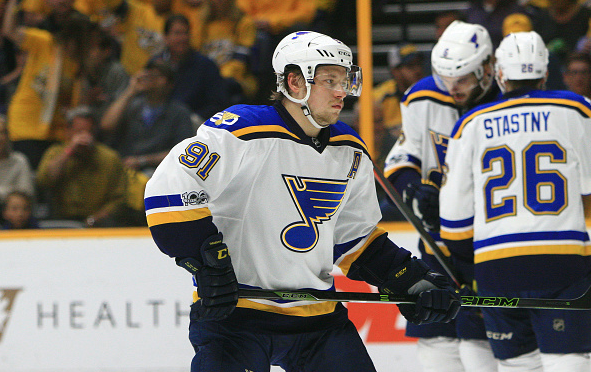 One of the Blues most reliable players, Vlad notched up 75 points during the regular and also contributed 6 points during the playoff run. He might not ever win the Hart Trophy, but he is threatening to take St Louis places. Hopefully, we won’t have to wait too much longer for the Blues break their cup duck. Many were expecting Patrick Laine to be the talk of the town, then Mark Scheifele came along. Posting career-high numbers of 82 points, Scheifele looked like a changed player. Laine is seen as the future of the franchise, Schefiele is also staking his own claim to this as well. Forming a deadly partnership together, Winnipeg has a hidden gem in the 24-year-old. They narrowly missed the playoffs this year, expect Schefiele to an equally big threat next year.